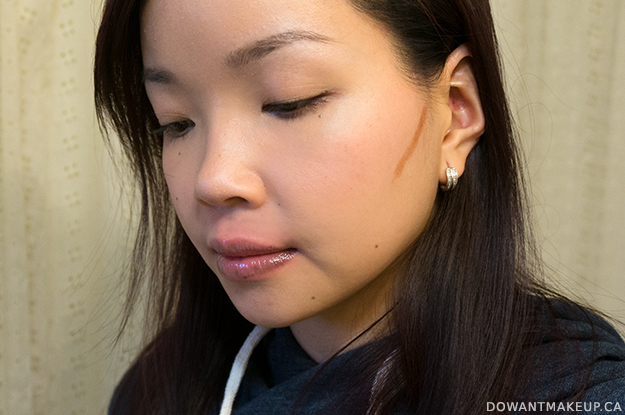 Sculpting Contour is a matte brown. 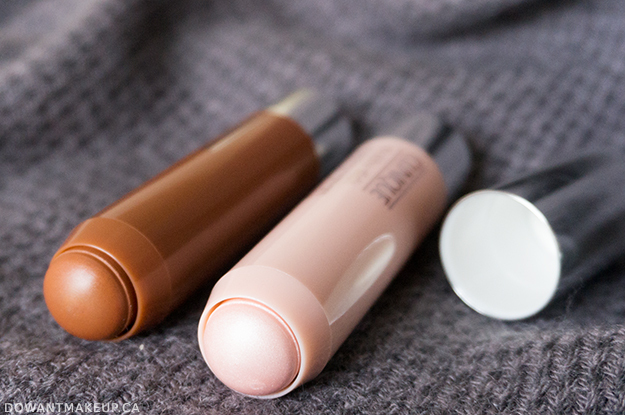 Sculpting Highlight is a shimmery cool pink. The rounded end of the sticks creates relatively fat lines--great for quickly swiping in the hollows of your cheeks or dotting on the top of your cheekbones, tricky basically anywhere else on your face. For smaller areas, I rubbed a fingertip or a small brush on the stick to pick up product instead of applying directly from the stick. I'm Team "Contour Products Must Be Cool-Toned, Dammit", so I had some concerns because Sculpting Contour looked a little warm. 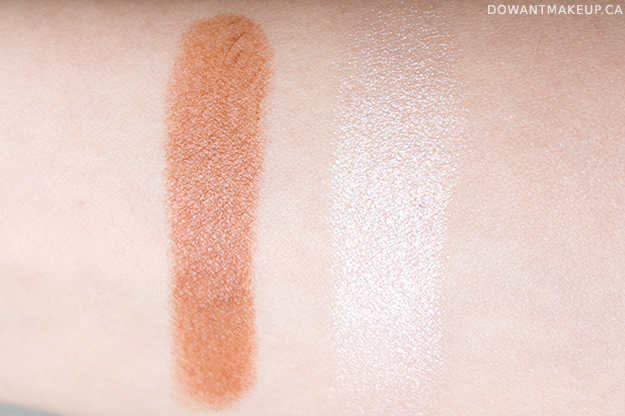 When swatched next to my beloved Becca Lowlight Sculpting Perfector, the Clinique looks practically orange. But, I was really determined to test it thoroughly and report back. I drew Sculpting Contour in a short diagonal-ish line from roughly the top of where my ear meets my hairline to almost halfway towards the corner of my mouth. If you haven't tried contouring before, take a minute to get to know your face. Examine your face under bright lighting and take notice of where the natural shadows of your face fall. Touch your face, figure out where your cheekbones are. You are trying to emphasize the shadows. Your contour should be placed in the hollow of your cheek, just underneath where your cheekbone juts up and out. I usually hate using my fingers to apply makeup, less for sanitary reasons than for the fact that brushes almost always produce much better results for me. However, in this case I actually prefer using my fingers to gently blend the line in two directions: first pulling slightly towards the mouth a little more, and then blend up. 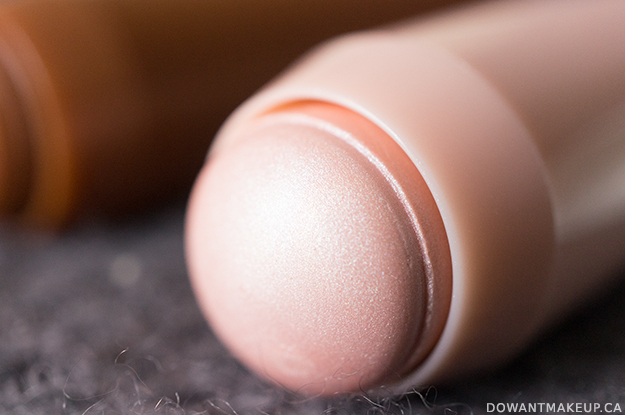 Sculpting Contour is creamy without feeling oily, and imparts product with the gentlest swipe. It's also super blendable. I spent several minutes with that line sitting on my face unblended while I tried to take photos, and it still blended out effortlessly. I know its hard to tell between the two photos (especially because they're different angles =__=) but it does make a difference. Because it's so blendable, the effect of Sculpting Contour ends up being very subtle, which I like--I'm not a fan of aggressive contouring. It did photograph a little brown/warm but it actually appeared less warm (even more believable) in real life. 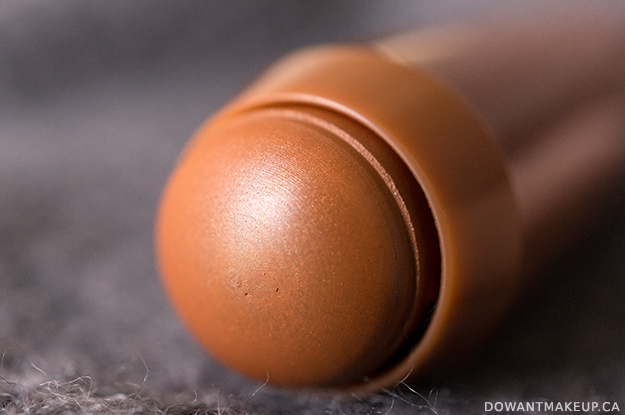 I had some reservations because it appeared rather warm, but because of the blendability, Sculpting Contour works pretty well as long as your skin leans a little warm (for reference, I'm neutral-leaning warm. Or maybe warm-leaning neutral? I dunno.) I am concerned about this being believable on someone that is cool-toned and fair though. Out of habit from using powder contour products, I tended to apply this after powdering my face, and it was totally okay on my normal/dry skin. You can (1) set it (carefully) with a second, powder-based contour product or (2) blend a little less and then apply your usual face powder, which will finish diffusing the contour for you. For (2), I would suggest pressing/patting the powder on to the contoured areas rather than using a swirling motion, or you risk buffing it out completely. For fairer skin or an even more subtle contour, try blending it with a damp sponge either after or in combination with your foundation. Here's another photo from testing, on a different day. (I know the skin tone isn't quite the same as previous photos. It stresses me out.) I contoured a little more heavily so you can see my cheekbone is a little more carved out. I applied a second line on top after blending the first one, and also drew and blended out a third line right along my jaw. 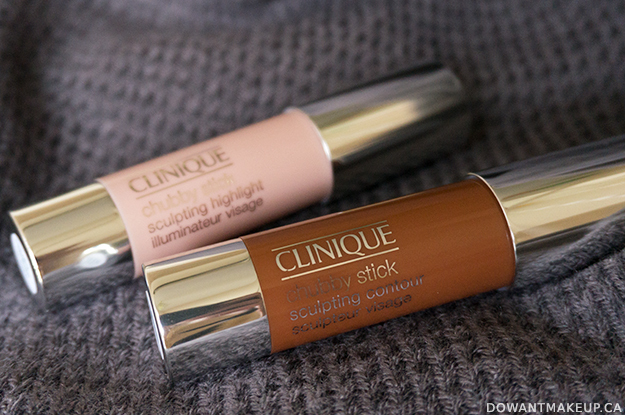 So, my thoughts on Clinique Sculpting Contour Chubby Stick? I like it. 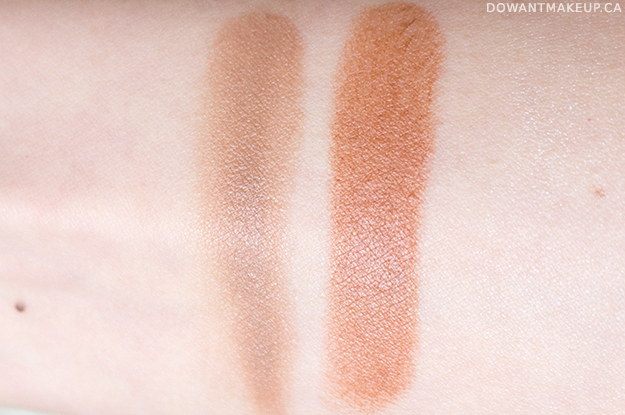 I would prefer if it was a little more neutral/cool-toned but it does work for me. I would not recommend it to someone that wasn't at least a little warm-toned. While not my absolute favourite, its convenient format and high blendability makes it a good choice for a subtle cheek-sculpting effect. However, I personally would not use it to contour around the nose because I think the warm tones become more evident when it's used basically in the centre of your face--it's more of a focal point and a more visible area. This is especially great as a beginner-friendly product because of the previously-mentioned subtlety and blendability, but also because you don't need a special contouring brush--you can get great results applying straight from the stick and then using your fingers to blend. 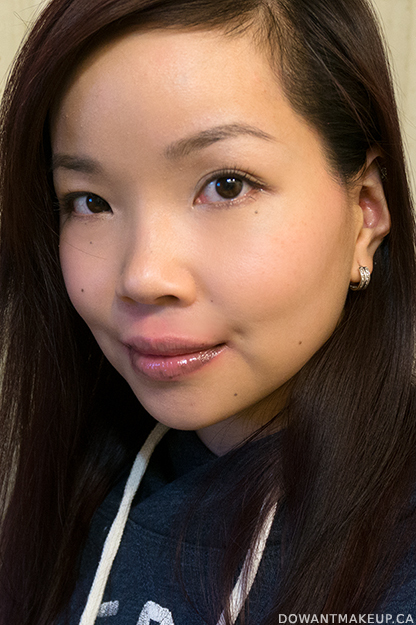 Okay, so Clinique Sculpting Highlight kind of fell to the wayside as I focused a lot on its contouring sister. I'm not big into highlighting so I'm not sure if I would have gone out of my way to purchase it, but I do like it. I use this on the very top of my cheekbones, as well as right under the arch of the brow, on the very tip of my nose, the inner corners of the eyes, and (if I didn't have eczema) on the cupid's bow of the lip. For everything but the cheekbones, I pick up and apply product with my fingertip or a small, flat brush. It has a pretty, glowy effect and isn't crazy sparkly. 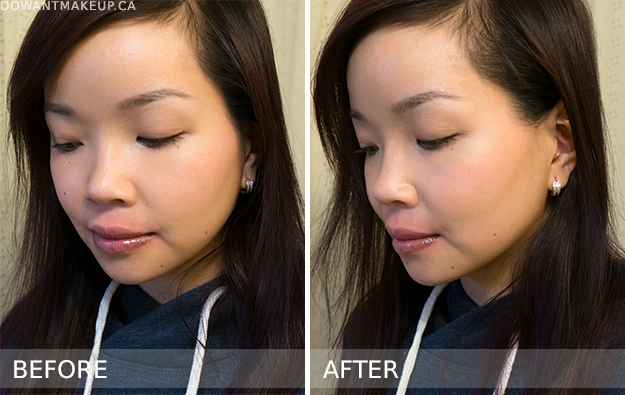 Like Sculpting Highlight, it doesn't feel oily or heavy and imparts product easily.